Pills, patches and needles can pose unintended and potentially fatal threats if they aren’t disposed of properly. That’s why authorities created regulations for safe disposal of prescription drugs and medical devices. All expired, unwanted or unused drugs and devices, including prescription pills, liquids, patches and over-the-counter medicines, inhalers and injectable products, should be disposed of as quickly and securely as possible. The goal is to help reduce the chance of accidental or intentional exposure. 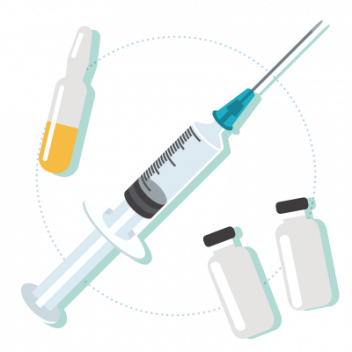 The U.S. Drug Enforcement Administration and the U.S. Food and Drug Administration provide guidelines and regulations for safe disposal of all unused medicines and potentially dangerous devices, such as syringes used to administer certain medicines. The DEA works with local governments and private entities to provide safe drug disposal opportunities for the public. You can find DEA-authorized collectors online. Local governments and law enforcement agencies also participate in drug-disposal events. More than 4,200 local governments across the country participated in the DEA’s last National Prescription Drug Take Back Day in November. Consumers got rid of a record 912,305 pounds of unwanted pills during National Prescription Drug Take Back Day in November 2017. The public dropped off a record 456 tons of medications at 5,300 collection sites. That marked a six-ton increase from the previous drug-disposal event earlier in 2017. If a patient has questions regarding the safe disposal of a medication or device, they should contact their pharmacist. Local health departments can also assist with instructions for disposal or the retrieval of sharps disposal containers. The local waste management service may be able to answer questions about whether certain drugs or devices can be disposed of in a person’s household trash. Mix any leftover medicines with an inedible substance such as dirt, kitty litter or used coffee grounds. The point is to make the mixture unappealing to both children and animals. Place the mixture in closed container, such as a sealable plastic bag. Throw the container with the mixture into the household trash. Use a permanent marker to black out all personal information on prescription labels of empty pill bottles or other medicine packaging. Then discard the materials. Inhalers and other aerosol products can pose an environmental concern if they are punctured or thrown into a fire or incinerator during disposal. 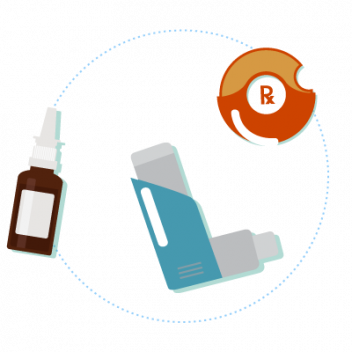 Inhalers are portable devices that administer a type of drug that is to be breathed in. These products are often used by patients who have asthma or other breathing problems, such as chronic obstructive pulmonary disease (COPD). When disposing of inhalers, people should read instructions on the labeling and follow local regulations and laws regarding the disposal of aerosol products. Most inhalers can be safely thrown into the household trash or recycled. Unused or expired injectable products, such as those used to take insulin for diabetic patients, can be safely disposed of using a sharps disposal container. If a person needs assistance obtaining such a container, contacting your pharmacist that dispensed the injectable medicine is a good place to start. Short-, rapid-, intermediate- and long-acting insulin medicines, including Humulin, NovoLog, FlexPen, Novolin, Levemir, Lantus and Tresiba, are all injectable products that require safe disposal via a sharps disposal container. Sharps disposal containers should only be filled about three-quarters full before the container is disposed of. Sharps containers should never be overfilled. All injectable products should be safely and securely out-of-sight and out of immediate reach in a sharps disposal container. Sharps disposal guidelines may vary depending on where a person lives. 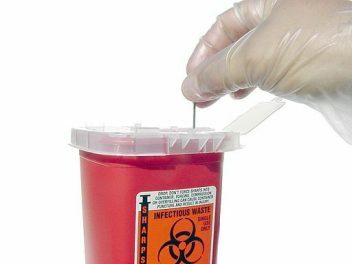 Patients should follow local guidelines regarding the safe disposal of sharps containers. Whenever possible, a patient should attempt to secure a sharps disposal container with a mail-back box, which allows for injectable products to be returned after use to a company for disposal. People can check with their local trash removal service or health department to learn about safe methods for disposal of sharps containers where they live. Some medicines can be especially harmful — in some cases, fatal — to others. To prevent accidental exposure or ingestion of these substances by children, pets or others, you should dispose of these medications immediately and responsibly when no longer needed. Although some drug labels recommend flushing, counties in every state across the country offer safe disposal of medications. To ensure the safety of your family and pets, always keep medications out of reach in a locked medicine cabinet until you are ready to dispose of them at a local drug take-back event or at your pharmacy, hospital or health department. Never flush medications down the toilet or sink.